Between all of the high quality independent, all age titles, and the endless number of retro titles being rebooted as of late, kids today have countless reasons to fall in love with comics. Boom Studios, now gives kids one more reason to be stoked about the world of comics, the rebirth of everyone’s favorite lasagna eating feline, the one, the only, Garfield. Making his triumphed return in a brand new monthly series, Garfield pays fan service to old school fans, while modernizing itself just enough to draw in a new generation of potential readers. Featuring stories written by the legendary Mark Evanier, and artwork by renowned cartoonist Gary Barker, this new series is guaranteed to deliver the same high quality adventures, readers have grown to expect from the franchise. Many of our readers out there have kids, and have reached out after previous looks at kid friendly titles, asking for further recommendations. 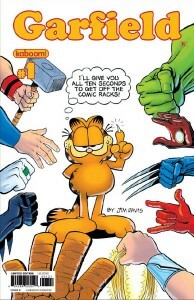 What better way to introduce or further your kid’s interest in comics, than with a time tested classic like Garfield. The debut issue is split into two stories, the first entitled “Collectors Classic”, revolving around Nermal’s discovery of what appears to be the very first issue of the comic book, Ultra Powerful Guy. The second story entitled “Big Mouse Meal” features Garfield’s most unlikely yet best friend Squeak the mouse, after being caught leaving Garfield’s house by Big mouse, Squeak, is told again and again that mice and cats can’t be friends. Big mouse continuously brings up the fact that “cats eat mice” and vows to prove that Garfield is no different despite his reputation. Anytime you have such recognizable names, which have been involved with a franchise for years upon years front a series reboot, it is often safe to say that it will be treated with love and respect. Exactly the case with the new Garfield run, both of the initial stories are exactly what returning fans will be expecting, countless fun, cleverly intertwined with positive life lessons. The perfect series for adults, who grew up with the big orange cat, looking for another way to bond with their kids, the book stays so true to the past material it makes the perfect lead in, to an introduction to past incantations as well. Long time fans without children will also fall in love all over again, and find themselves fighting the urge to go watch the classic animated series Garfield and Friends. Boom Studios, have now managed two successful reboots, between, Garfield, and the earlier rebooted Peanuts comics. Bringing up an interesting question, what other old school comic strips would you like to see revived. Feel free to leave your answers in the comments sections, and go check out this wonderful debut issue of Garfield.